Theatrical Scamp Rock to send you down a spooky path to your Grandmother's house of nightmares. Fable Cry began in Nashville, TN when Zach Ferrin started putting his imagination to song. The year was 2010, and he was determined to take the music, art, and stories he had been cultivating to one great platform where he could share them. He and and his sister, former member Kirstie Ferrin, had half of what would become their first album written before they would have a title by which to call themselves. The songs were all rambunctious, melodic, and wrapped in themes of legend and myth. 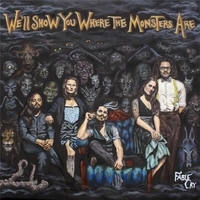 "Fable Cry" was born, and in 2011 they self released their self-titled debut album. Between the two of them they played guitar, violin, accordion, drums, bells, kazoo, ukelele, banjo, and cello, and they tried their best to include as much of it as possible in their live shows, along with humorous intros, crowd participation, and twistedly playful "Story Time" between songs. By the end of 2013, after 4 elaborate music videos, several national tours, and lots of writing, Zach decided that it was time to expand Fable Cry and build a band that could properly play these songs that were too big for him alone. That void was soon filled by four amazing musicians - Jo Cleary (violin, vocals), Scott Fernandez (bass), Rachel Gerlach (drums), and Joshua Dent (cello) - and they immediately hit the studio to record and release their first single/music video together in the Autumn of 2014 entitled “Fancy Dancing”. And the “new” Fable Cry was born. Now a full band, they could perform the songs the way they had always been written, packed with energy and dynamics, while maintaining (and inevitably amplifying) the band's theatrics, costumes, makeup, and overall ruckusness, and developing this new and matured sound that they came to call, "Theatrical Scamp Rock". They spent the next few months writing and recording what would become their Sophomore album, filled with songs inspired by life through classic horror tales, and originally spooky themes, entitled “We’ll Show You Where the Monsters Are.” It was released on August 25th, 2015. "If you’re a fan of Danny Elfman or Tom Waits, this [..] is going to be right up your alley! It’s got a delightfully eerie gypsy-esque feel and the instruments playfully accentuate and accent the lyrics." "...one look at the colorful music and costuming of these musicians is more than enough to give substance to the phrase [Theatrical-Scamp-Rock]. Looking like they rolled out of an alternate version of Terry Gilliam’s 'The Imaginarium of Dr. Parnassus' reimagined by Tim Burton, Fable Cry spin inventive, cabaret-ready yarns that are given life by their palpable musical energy." "The juxtaposition of the story telling techniques of Tom Waits and the Eastern European feel of Fable Cry’s music make an interesting contrast. This band is definitely different from the usual. Their shows are supposedly carnivals of fun. Bands like Fable Cry are just what rock and roll needs."